Dress-down Fridays (aka casual Fridays) are powerful. At once they can fill the office with equal measures of pure joy—“Yay, no need to lace up in formal office wear today!”—and heavy dread for those who just don’t know what to wear on such an occasion. We get it—dress-down Fridays are great in principle, but it’s important to remember that you’ll still be at work conducting business alongside your boss, colleagues and possible clients too. That said, you’ll need to strike that balance between casual and professional. For fashion girls, that means knowing which trends are office-appropriate and those that should be reserved for weekend dressing. Case in point? Off-the-shoulder tops. If your 9-5 office attire is typically buttoned-down shirts and blazers, then hitting the meeting room with bare shoulders may be too much of a leap. It’s all about gauging the level of casual your office is on board with. If you’re unsure of where to start, fear not. We’ve rounded up 15 dress-down Friday outfits that should see you right—no matter the office vibe. Keep scrolling for the best office-appropriate casual Friday outfit ideas straight from the fashion girls of Instagram. Style Notes: This is an easy formula to wear on repeat. Look for smart midi dresses (detailed collars, cuffed sleeves and nipped-in waists always look put together) and finish the outfit with box-fresh trainers. Style Notes: If your office is cool with jeans, it’s best to keep distressing to a minimum and avoid ripped styles. Teaming denim with an oversized white shirt is a great way to keep the look feeling relaxed yet business-like. Style Notes: If your workplace’s idea of casual still errs on the business side, keep your blazer and swap sombre separates for more lively alternatives. A printed pencil skirt and colourful shoes will immediately inject some fun. Style Notes: Swapping shirts or blouses for a crisp white tee is an easy way to do a dressed-down look. Keep it feeling chic by adding an oversized blazer and block-heel slingbacks. Style Notes: Short suits are here to make summer offices a cooler place in all senses. Dress-down Fridays are the perfect moment to experiment with the look. Just add smart sneakers or brogues to keep things feeling fresh. Style Notes: Overalls are super fun and definitely live at the relaxed end of the dressing spectrum. Keep denim pairs looking professional by layering them with a shirt or blouse and adding heels. Style Notes: If shorts aren’t for you, then try upping the hemline on a skirt suit instead. Team your co-ords with a slogan tee and cool trainers to strike a balance between smart and casual. Style Notes: Floral midi skirts are super versatile and well worth investing in as a key wardrobe staple. Team yours with a blouse and Converse to hit the perfect note come Friday. Style Notes: This is another easy formula that’ll work in all offices. Maxi dresses are ideal, as you don’t need to worry about varying opinions on shorter hemlines. Look for fun collars and colourful prints to keep things fun, and finish with flat mules to add a professional touch. Style Notes: Another great combo if dress-down Friday doesn’t mean super casual for you. Look for tailored trousers cut from lighter, relaxed fabrics, and then finish with sleek trainers and a classic white crew neck. Style Notes: A printed blouse is a fast and effortless way to keep dress-down Fridays feeling smart. Look for fun sandals that’ll complement (or clash if you’re feeling bold) with your print, and then team them with cropped trousers. 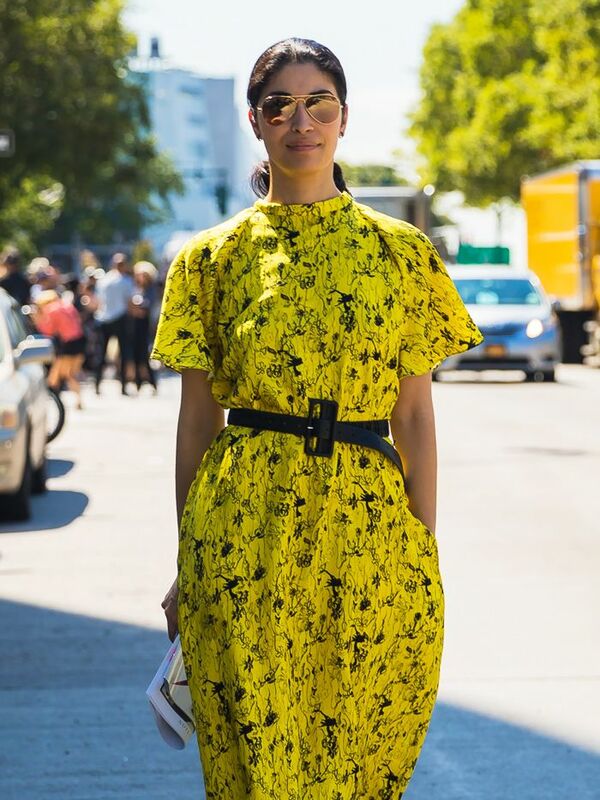 Style Notes: A key piece in any work wardrobe is a good shift dress. By simply adding a smart pair of trainers, this piece looks business-casual. Style Notes: If your 9-to-5 typically calls for black, white or grey, then mix things up come Friday with a tailored suit in a bold shade. Adding comfy flats or trainers will keep things feeling relaxed. Style Notes: If you’re going for a slip dress layered over a white T-shirt, look to luxe fabrics like silk or satin to add some polish. If in doubt, simply throw a blazer over the top. Style Notes: Keeping everything all black always adds a smart feel to relaxed combos. Finish with Converse and a logo belt to add a playful edge that still looks considered. This looks great with trainers or heels. Slip these on with maxi dresses or jeans. A printed midi like this is easy to dress up or down. These sneakers are an Instagrammer favourite. You can’t go wrong with a bold midi dress. A fun twist on “ugly” trainers. Essential for keeping casual looks smart. Pyjama shirts hit the sweet spot between formal and relaxed. Everyone needs smart denim in their wardrobe. You’ll get so much wear out of this print. Perfect with heels or flats. Next, 15 office-friendly dresses you’ll want to show off at work.